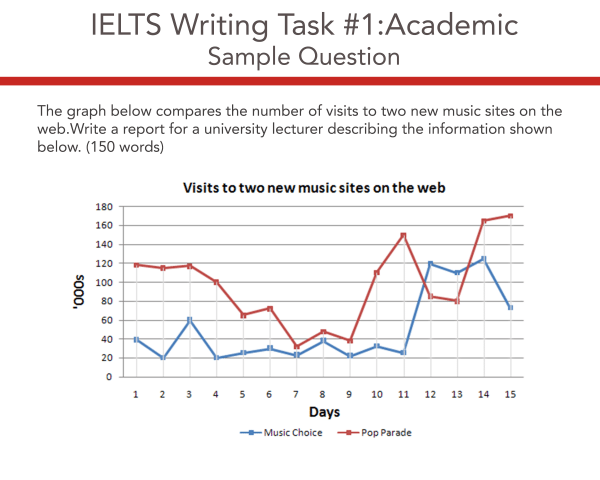 Home IELTS Academic Writing Task 1 Model Answer – Line Graph – Visits to two new music sites on the web. The line graph compares the visitor activity on two music websites over a 15-day period. The number of daily visits are given in thousands. Overall, both websites experiences an upward trend. The music website "Pop Parade" was by far the more popular choice over the time period, starting out with three times the number of visits compared to "Music Choice" and finishing at double the number of visits. However, there was a short time period of two days where "Music Choice" trumped "Pop Parade". Being the generally less popular website of the two, Music Choice started out around 20-40 thousand visits per day and remained at that level with only slight fluctuations until a sharp increase in the number of visits on day 12, when 120,000 visitors were recorded. Numbers plateau at this level for 3 days before they fell sharply to less than 80,000 on day 15. The activity on the "Pop Parade" website showed an overall higher level of variability, starting out at 120,000 visits, then decreasing steadily to less than 40,000 on day 7 and rising again sharply to reach 150,000 on day 11. This was followed by another dip and subsequent sharp increase before peaking at the end of the time series, recording more than 160,000 visits per day. 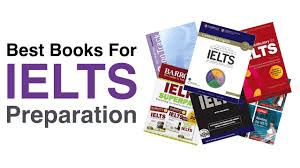 IELTS Academic Writing Task 1 Model Answer - Bar Chart - Different modes of transport used in one European city.IELTS Academic Writing Task 1 Model Answer - Pie Charts - Electricity generated in Germany and France in 2009.